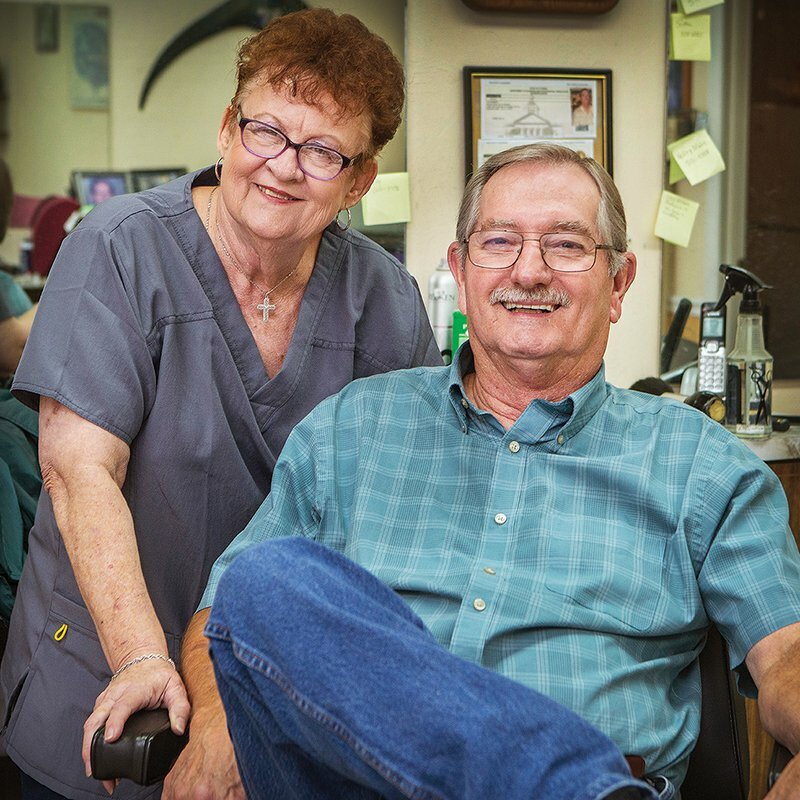 This pair of barbers have been cutting hair and trading barbs for quite some time. 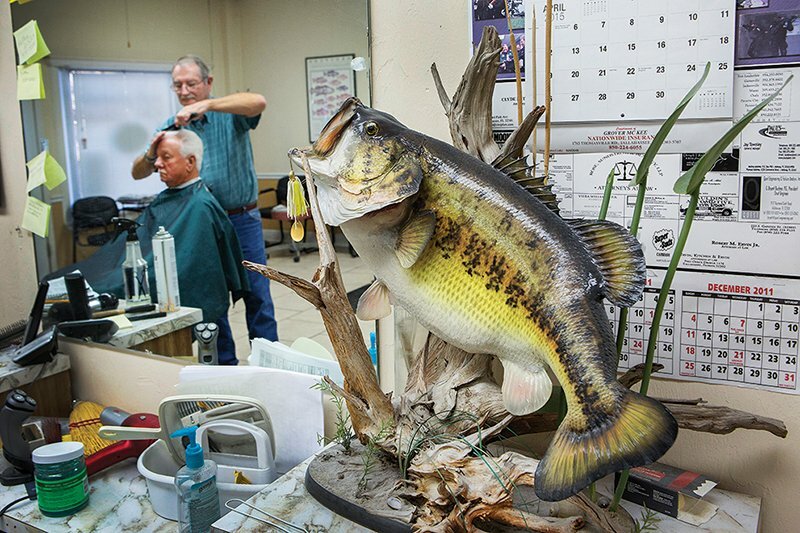 An old timey pin-up calendar, one featuring the art of Alberto Vargas, would not be out of place among the mounted largemouth bass, the marlin tail, the framed map that locates cities with NFL franchises and the clock fashioned from a varnished slice of cypress wood, all of which festoon the walls at the University Styles barber shop on Thomasville Road. And, the truth is, Glenda Langston wouldn’t object. Far from seeing the calendar as somehow contributing to the creation of a hostile workplace, she would dismiss it as simply Archie Hamilton being Archie Hamilton. Langston and Hamilton have been cutting hair together for 47 years, first at a shop leased by another barber, Larry Black, on Tennessee Street. Neither admits to playing second chair to the other. “We get along because he does what I tell him to do,” Langston asserted, albeit with a wink, and then, as if caused by retaliatory energy sent by Hamilton, a tower of miscellany stacked behind Langston’s desk in a corner of the shop tumbled to the floor. The random assortment of items behind the desk includes a can of SPAM, a zip-lock bag full of Chex cereal, knitting supplies, a stress ball, card files, a Payday candy bar, hand lotion, eight rolls of Scotch tape, Clubman talcum powder and a telephone from the 1990s. Perhaps inadvertently, an experiment that may one day determine the half-life of a cinnamon roll is underway. “Archie and I are like brother and sister,” Langston reclaimed her train of thought. “He picks on me all the time, but I can take it.” She, after all, has seniority. Hamilton is 66; Langston is 67. Black purchased the shop on Thomasville Road in 1983 and Hamilton bought it from him in 2002. Today, the shop’s clientele is mostly white-haired and almost exclusively male. Chatter runs from football to fishing, restaurant reviews, dogs that are jumpers versus diggers, inane state regulations, current events, Viagra and surgeries. A customer who sustained a compression fracture in his back in picking up a large bag of dog food described the surgery that was performed on his L4 vertebra. Hamilton, in turn, talked about the work, performed on his C7, that was necessitated by an auto accident. He’s been sleeping on his side with a pillow between his legs ever since. Another customer talks about his ongoing recovery from bypass surgery. That is one eventuality that Hamilton claims he doesn’t have to worry about. At the shop, banter cements relationships and unifies all who stop by. Langston has lived in Tallahassee all of her life. She was born at Tallahassee Memorial, graduated from Rickards High School, thought about a career in nursing, but then, like Hamilton, instead went to Tallahassee Barber College. She has nine siblings. Hamilton has cut the hair of lots of Tallahassee notables. He nodded toward a waiting customer and said, “For example, there’s Ross Morrell, who was the director of the state Division of Archives for a long time. I’ve been cutting his hair for 40 years. It wasn’t always white like it is now. Asked to offer up something few people know about Langston, Hamilton volunteered, “She’s actually redheaded,” and the shop, even the retired archaeologist, erupted in good-natured laughter. “But sometimes, people need to listen to their hair,” Hamilton added. “They come in here and want a particular style and we can use enough spray and gel to make it happen, but a day later, it’s gone and they can’t put it back.